We sell machines which meter, mix and dispense two part systems like epoxies, silicones and polyurethanes. The machines can be used for manual application or integrated into automation, including mounting on robots. We have precision systems which volumetrically mix and dispense small discrete shots and beads from as small as 0.012ml. 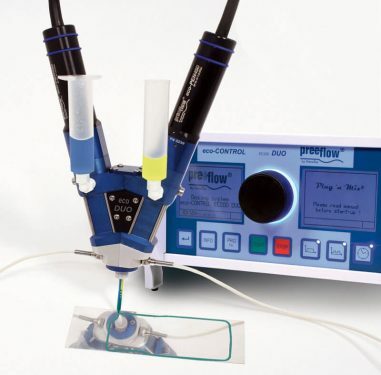 The preeflow eco-DUO high precision volumetric dosing unit doses, mixes and dispenses a wide range of materials for two-component dispensing with absolute control.The preeflow eco-DUO 330, preeflow eco-DUO 450 and eco-DUO 600 are two-component precision volumetric, positive displacement, dosing/mixing/dispensing systems that give you accuracy and repeatability.